Looking for the right photographer for you and your needs can be very challenging. 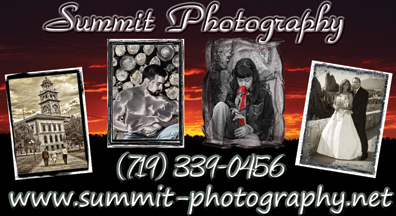 At Summit Photography, you can rest assured that your every photography need will be met. Jason Wichman, the owner and lead professional photographer of Summit Photography has over 15 years of digital photography experience. In addition, Jason has a vast background with computers, technology, and photographic programs that not only can enhance the portrait, but often times make it timeless. Not bound by traditional film photography ways; combined with the technological knowledge of design, all your portraits and prints are custom designed for a once in a life time experience. Please look around, enjoy the prints, and note that anything is possible. Landscape prints can be customized into motivational posters by adding text and boarders. Portraits include retouch, and can include many special effects including Sepia, B&W photography, spot color, "the flood", intense color, make-up, hair tints, etc. The list is endless!